Q1. When did you grow a passion for Beauty and Makeup? Q2. So you are balancing a 9 to 6 along with your side gig, how has the journey been so far? Q3. Apart for being a successful blogger you have recently started a YouTube channel, Congratulations for that. What are the challenges you had to face while making content on a brand new platform? Q4. Everyone has an expert who somehow inspire them, who is your Beauty Inspiration and why? Q5. Do you feel that the Beauty Industry is saturated, since more and more youngsters are following the trend? Q6. Please highlight some Dos and Don’ts of buying makeup online, so our readers always grab the best deals. Q7. We really like your Brand name, tell us the story behind it. Q8. While stepping into this passion venture, who was your biggest support? Q9. Like all beauty bloggers you always seem to look flawless on and off camera, how do you pull that off? Q10. Lastly, would you like to acknowledge some wrongly stated facts / challenges about your industry that people from the outside are unaware of. 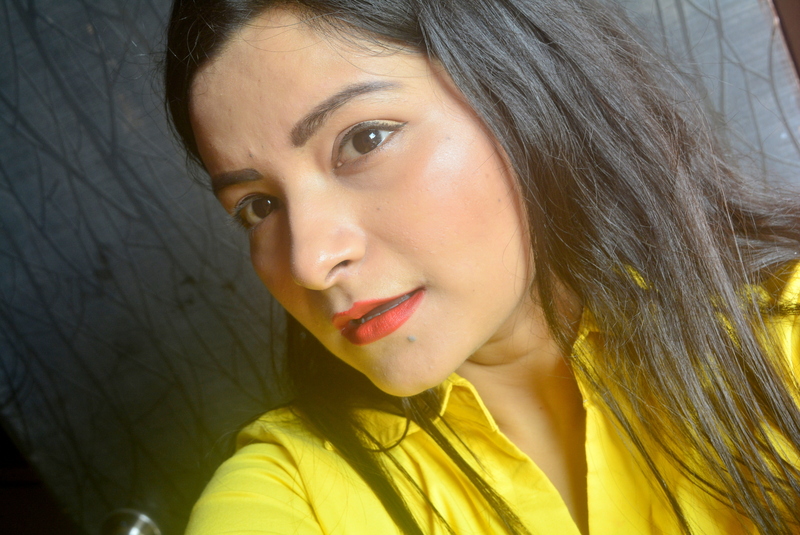 Khushi Agarwal Founder of Not Only Makeup Blog is passionate about Beauty, Makeup, Fashion, Food and Travel. You can find Product Reviews, DIY’s, Makeup Tutorials, Fashion Posts, Recipes on her blog. She has recently started her YouTube Channel where she showcases her skill in the broader spectrum. Watch out this Calcutta girl spreading beauty and Happiness much like her name. Khushi – I always liked dressing up and looking presentable. Since childhood I really admired my cousin sister who came up with these beauty DIY’s at home, I found myself inclined towards this and tried to make my own versions. This went on growing in me and I never stopped pursuing or doing something which I like. Soon it turned into my passion when I realised I could share it with the world through internet. I wrote for other blogs and decided to have my very own platform to let me breathe in my skin and do things just as I wanted. I never stopped pursuing or doing something which I like. Q2. You are balancing a 9-to-6 along with a side gig, how has the journey been so far? Khushi – Oh, it’s tough. I can go to flashback right away with this question. My journey has not been an easy sweep. There were moments when I wanted to give up, but then I thought what’s the harm in trying. I have always been a productive person. I thought rather than wasting my time, I could work a little harder for myself. I went with the flow. My family, especially my siblings were a constant support. The biggest support being in form of my Life Partner, who always pushed me to do the best and never give up. I thought rather than wasting my time, I could work a little harder for myself. Q3. Apart for being a successful blogger you have recently stepped into YouTube. Khushi – Thank you so much. YouTube was my ultimate goal, always. Honestly, I started with the blog with YouTube as an ultimate goal. I started recording a year in advance before my channel got live. I totally enjoy making videos, they unleash the real me to the world. Finding time to film was the biggest challenge. Not to forget, editing it is brain storming. But I love doing it and will always keep doing it. I totally enjoy making videos, they unleash the real me to the world. Q4. Everyone has an expert who somehow inspire them, who is Beauty Inspiration and Why ? Khushi – My ultimate inspiration is a YouTube called Shreya Jain. She has been there in the business for long and has paved her way to success. She is just like me, a juggler between duties and passion. She is a multi-tasker, like I am. I truly admire her and she gives me truck loads of inspiration. She is just like me, a juggler between duties and passion. Khushi -Yes, I won’t deny the fact. Every other female wants to showcase her beauty through social media these days. Even I was one of them, if you may say so. But the idea is to stick along and never give up. Sadly very few have the real passion to continue and go on. They think it’s easy to be in the limelight, but it’s a fancy world where dreams come true with hard work and inner spark. always grab the best deals. Khushi – Try and search a product on Google first. It will automatically show the websites which sell the products. You can compare the websites and check which ones give the best deals. If you have any confusion, I am just a ping away. Khushi – Yes, there is a concept behind this. I didn’t want my blog/channel to be just with makeup. There is a stereotype of girls being only addicted to makeup. But I wanted to break the monotony and show more of me. I love to Cook, Travel and Dress up. I try and present these on my platforms as well. That’s why the name Not Only Makeup. I wanted to break the monotony and show more of me. Q8. While stepping into this Passion Venture, who was your Biggest Support ? Khushi – My Family, each one of them. Starting with my mom who is very proud of what I do, she tells her friends about my blog and YouTube channel. It was for her, that what I look like today, she has nurtured me like a precious piece. Moving on to my siblings, I can’t even start as to how much support my gang has given me. From taking photographs, to lending their stuff and listening to my stories over the phone they have supported me throughout. And when I was low, wanted to relax and be free, basically give up, my husband is there to trigger my passion. If not for him, Not Only Makeup wouldn’t exist. He is the man behind the lens taking my pictures and shooting my outfit videos so selflessly and passionately. Khushi – The real beauty lies when you want to dress up for yourself and not for the camera. Camera just helps to capture your Beauty in a Frame, but the real beauty is you yourself. If you are beautiful inside out and in real, it will project through always, even without the shutterbugs. Camera just helps to capture your beauty in a frame, but the real beauty is you yourself. your Industry that people from the outside are unaware of ? Khushi – Firstly, the people around us, including some of our friends and family look makeup and beauty as something useless and waste of time. People here look down upon women who wear makeup. It’s like hiding the ugliness under makeup. They think, she isn’t pretty enough to go bare and needs makeup instead. It gives me pleasure to pursue my dreams and follow my passion without paying heat to their thoughts. Society is an opportunist, the moment you are successful they change. To all those who think being a beauty blogger and YouTube is easy, it’s not. It’s tough to continue and not give up on anything which you already do. It’s tough to make a mark, it’s tough to gain recognition. It’s tough to be you. Society is an opportunist, the moment you are successful they change. I enjoyed answering these questions. Thanks for the opportunity, Sonali.